The Lillyanna is a 1981 Compac 16. She was built in Florida, and before my ownership had somehow made it into Mexico and was in Colorado when I bought her. 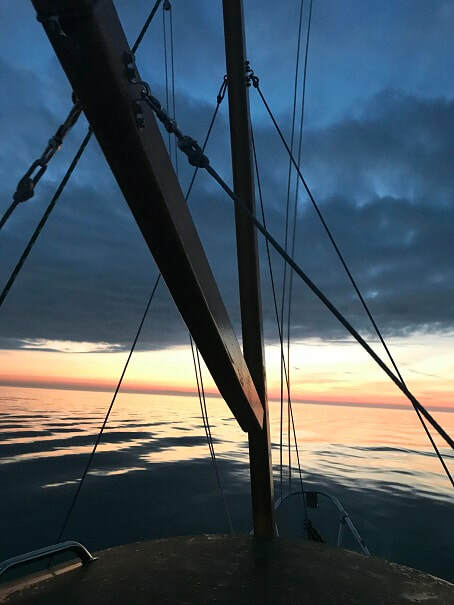 I made numerous modifications to the boat and now use it for family sailing in Wisconsin, as well as for what has become an annual 3 night, four day, adventure on the great lakes with my brother. Below you will see a summary of modifications and photos of the modifications. The Compac 16 is, in my opinion, a fine craft, well above average in sturdiness, stout, well-thought-out, and great for shallow coastal exploration; with the one significant weakness of being a poor pointer into the wind, and a ship that easily yields leeway due to the shallow keel. 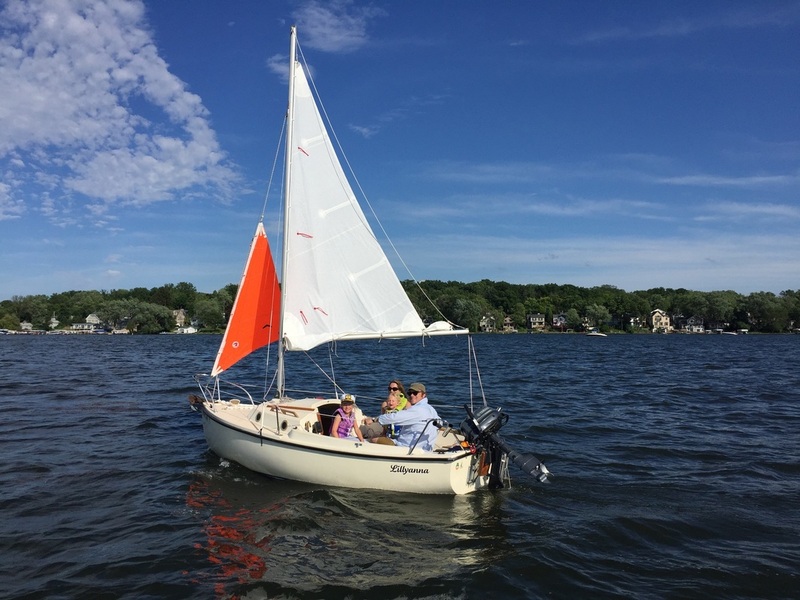 I love my Compac 16; she is seaworthy, fun to sail, sails well before the wind and on a reach, is great for the family and for adventure, and makes a great little boat for trolling for salmon on the Great Lakes (under wind or gas power). The photo above is of the Lillyanna at anchor off of Rock Island looking south with Washington Island, the Portes des Mortes passage, and Door Country Wisconsin in the background. We swam ashore and hiked the island. ​Use the information at your own risk, please make safety your first priority, the author does not claim responsibility for the accuracy ​or inaccuracy of information on this site. 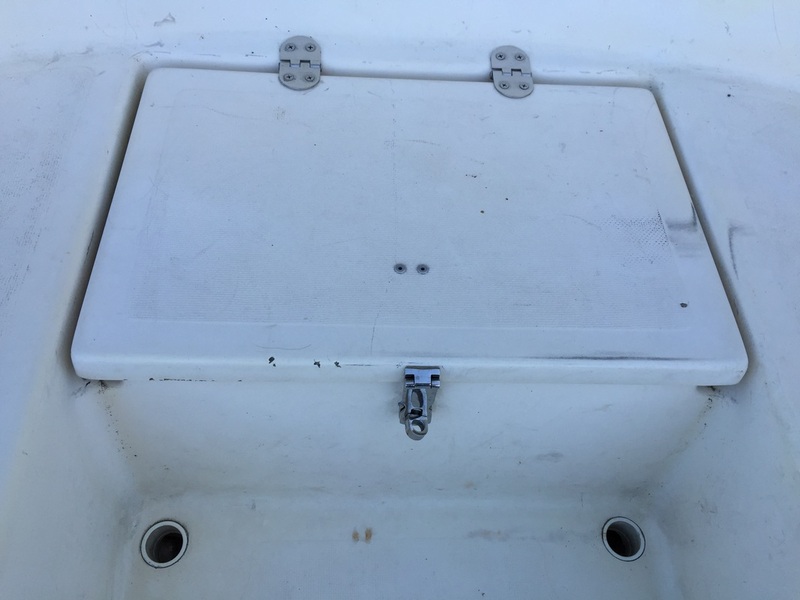 Over the winter of 2016/2017 I added a pilot house to the Lillyanna, including modifications to convert her to a fishing trawler for use on the great lakes trolling for Salmon and Trout. She has done well in that capacity already, and I think the modifications will make her even better for the purposes I use her for. Here is the new configuration for the Lillyanna, as of February 19, 2017. Shown is the "Fishing Trawler" configuration. 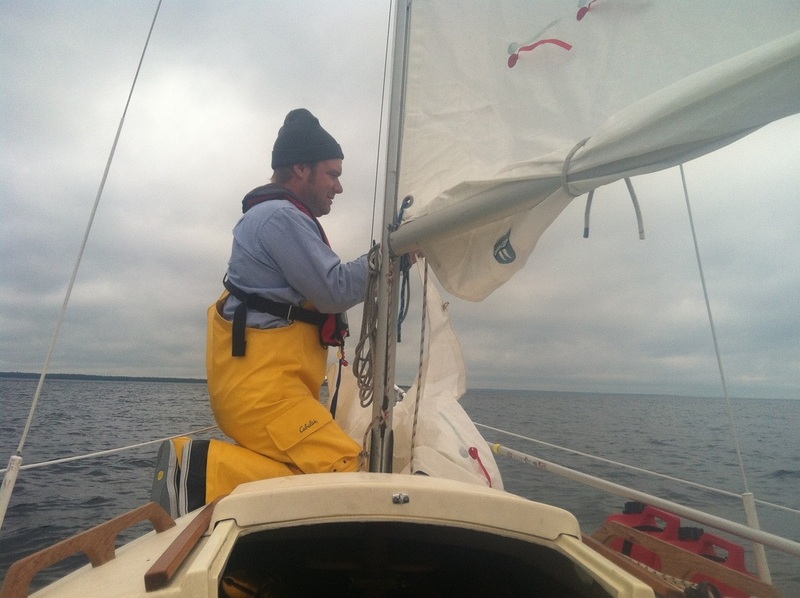 The Lillyanna can also be fitted with the original mast and boom and continued to be sailed as a fine sailboat. Storm Jib, 110 jib, and mainsail with a reef. New sails from Rolly Tasker. Home made whisker pole, made from extendable paint roller handle, shown above. Jib halyard and downhaul lines routed with Harken blocks and pulleys to the cockpit. 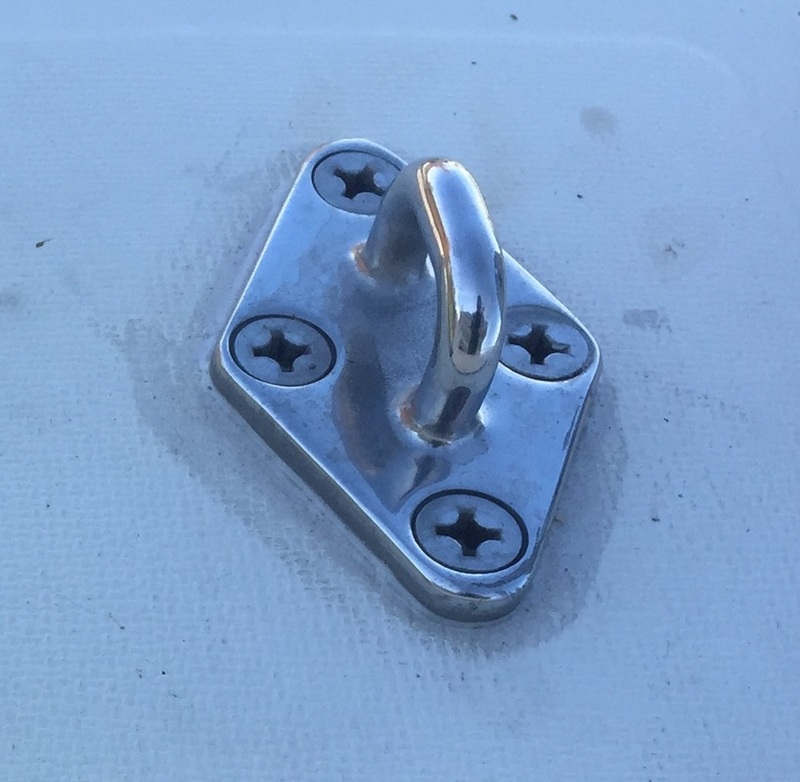 Upgrade of mainsheet blocks and tackle. 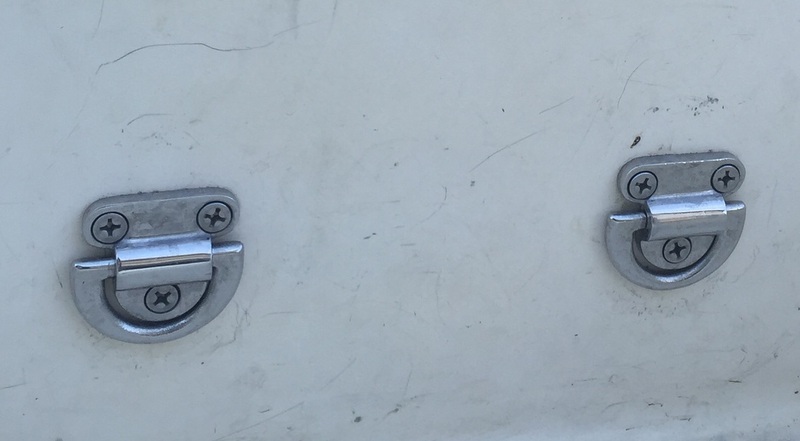 Stock mainsheet runs through a pad-eye, I added a Harken swivel block, fiddle and camcleat. Stern pulpits, Lifelines and boarding ladder. Lifelines shown above in photo. ……and don’t forget a bucket! 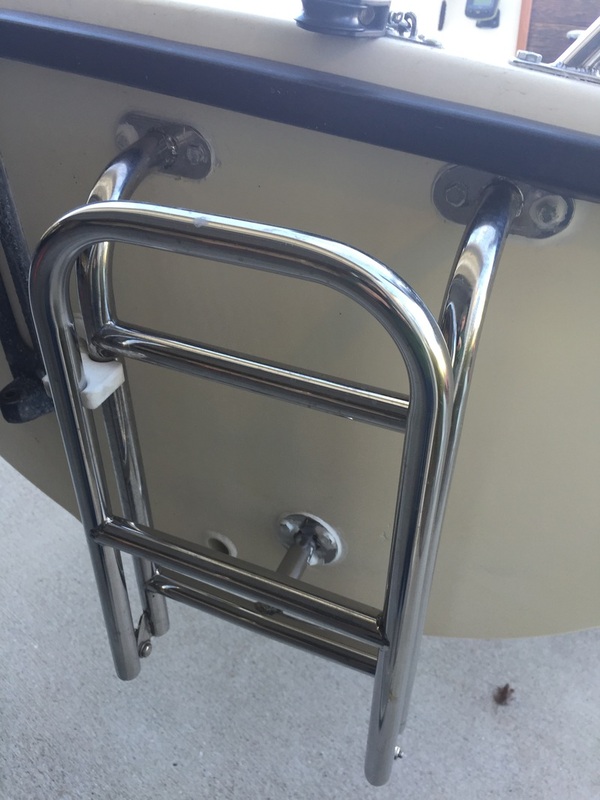 Cabin-top grab rails. Homemade from teak. Pad-eye mounted to the port-side of the mast tabernacle on the cabin top. 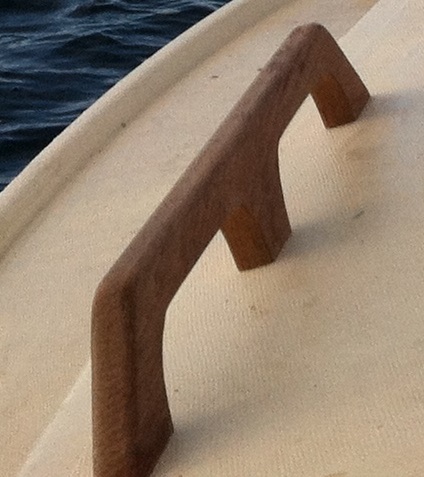 Used for tethering in when going forward of the mast. 3/4" Oak backing plate on the inside. Two flip-up pad-eyes for tether attachment. In the cockpit. For tethering in when in the cockpit area, and positioned such that you can reach the motor and mainsheet controls while staying tethered in. Mounted with 3/4" oak backer blocks. 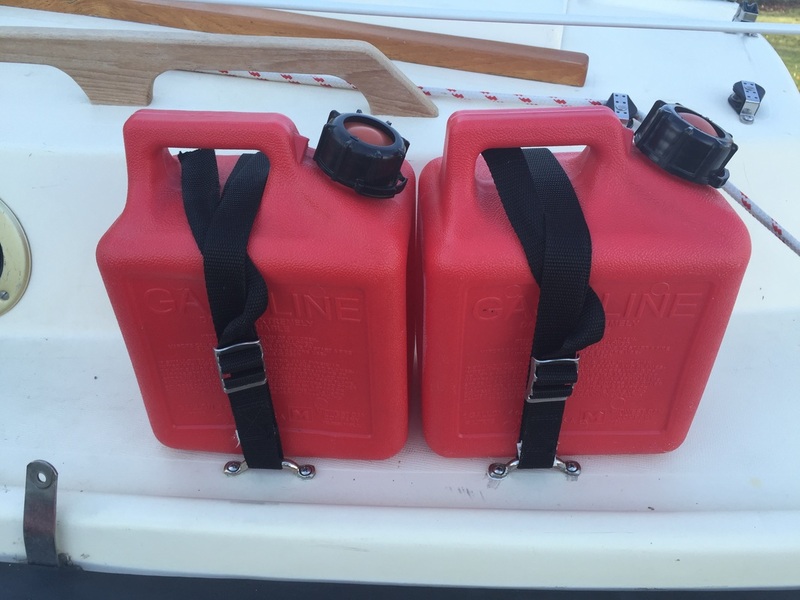 Spare fuel storage. Have never used all of it, but like to have it. Cruising boots, heavy weather gear, PFD with built in harness/tether attachment point. 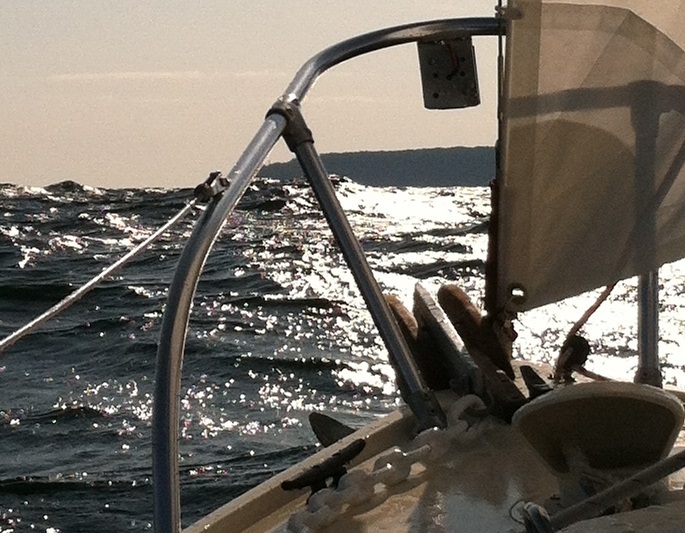 Shown here reducing sail as the wind picks up in northern Lake Michigan. Water temps in the 50sdegF (and this is mid-summer) so don't go in accidentally. Electrical system powered from 12V battery. Cabin light, fan, anchor light, running lights, 12V charger, bilge pump. 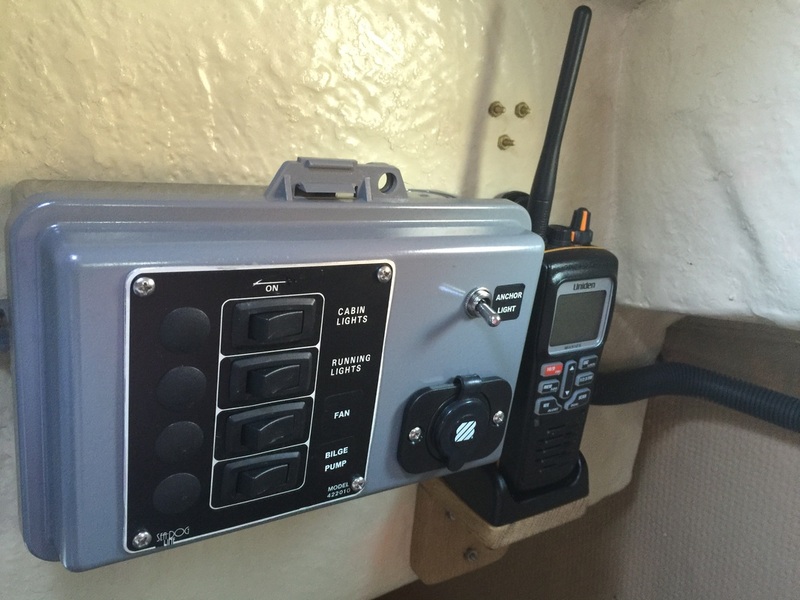 Marine floating VHF radio. Oars are fantastic on a boat this size!! and a great safety feature, I know from experience. Sailing on a variable gusty day on Pewaukee Lake, Wisconsin. Taking it easy with the family aboard and under reduced-sail.